Burst discs are an accepted pressure relief device used to protect equipment, vessels, piping, and personnel wherever pressurized equipment is used. They are a cost-effective method of providing safe and immediate venting of liquids and vapors. They may also be used in series with relief valves, in which case they provide a corrosion resistant barrier protecting the relief valve. · All discs tested in accordance with the ASME Code, Section VIII, Division 1. · Discs destructively tested to confirm the burst pressure at ambient temperature. · Records maintained for traceability of each lot. · No fatigue failure (as is common with metal burst discs) for pressure cycles up to 75% of rated burst pressure. · Accuracy to within 5% of rated burst pressures of 15 psig and above. · Disc size, burst rating, venting capacity, bolt torque, temperature, and lot number clearly marked on each disc. · Full size range for nominal pipe size. · Standard burst ratings 5 psig through 150 psig, with higher burst ratings available upon request. 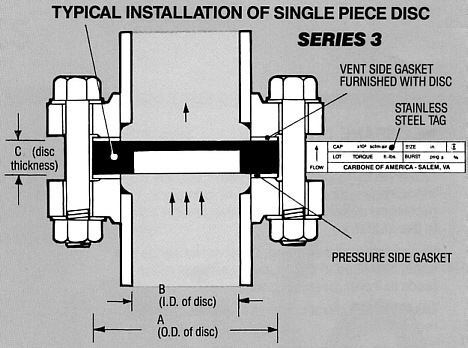 See below for standard dimensions and ratings of Graphite single piece burst discs. Graphite single piece burst discs are inexpensive and can be used in a variety of applications, especially in the chemical and pharmaceutical industries. A vent gasket is cemented in place on each single piece disc and should not be removed. This gasket ensures proper burst pressure and is included in the price. Similar gaskets are used in the testing of discs for establishing burst pressures. The process side gasket can be provided with the burst disc at an additional cost. · Burst pressures independent of temperature. · Standard burst ratings of 5 psig to 150 psig. Higher burst ratings available upon request. · Standard dimensions for 150 psig ANSI flanges. Discs sized for 300 psig ANSI flanges also available. · Size range of 1 to 24 nominal pipe size. · Steel armoring available for higher pressure and additional safety. · Special high temperature resins and spacers available for operating temperatures from 300°F to 700°F. · Low pressure burst rating discs available for pressures as low as 0.5 psig. Corrosion resistant and high purity applications (see diagram below).